d i v e r s i t y w o m a n . c o m W i n t e r 2 0 1 7 D I V E R S I T Y W O M A N 35 Professor George Eaton Simpson, who introduced her to the field of cultural anthropology. Cole went on to earn her PhD in anthro- pology at Northwestern University in 1967. It was at Oberlin that her passions for history, culture, and lifelong learning coalesced into a calling—teaching. Simpson's influence made her realize that as a teacher she could have the broadest impact. "To this day I consider myself a teacher first," she says. "e great African American writer James Baldwin once said, 'You cannot teach children that you do not love.' I felt that I had the respect, the admiration, and, yes, even the love of my teachers. I wanted to inspire like I had been inspired." For the next 20 years Cole taught anthropology at many uni- versities, including UCLA, Washington State University, Univer- sity of Massachusetts Amherst (where she launched its depart- ment of anthropology), and Hunter College. Along the way, she was instrumental in developing black study departments. Later, she also taught at Emory University in Atlanta, where to this day she serves as presidential distinguished professor emerita. "One hand cannot clap." — African proverb I n 1987 Cole got the opportunity to inspire not just a class- room—but an entire college community. She was appointed the president of Spelman College, the historically black women's col- lege in Atlanta. Remarkably, she was its first African American fe- male president in its 135-year history. (ere have been two since.) Spelman flourished under her leadership. In her 10 years at the helm, she built up a $113 million endowment, increased enrollment significantly, and raised the school's academic stan- dards and national ranking. She launched several centers and programs, including the Spelman College Mentorship Program, the International Affairs Center, and the Office of Community Service. In 1992 Spelman was named the number one regional liberal arts college in the South by U.S. News & World Report. While president, she continued to teach. She thought teach- ing was essential to her role as president. Teaching was not merely a matter of imparting information—it was also a way of learning. "She who teaches must learn, and she who learns must teach," she says, quoting an African proverb. In 1997 Cole retired and began teaching anthropology and women's studies at Emory University. 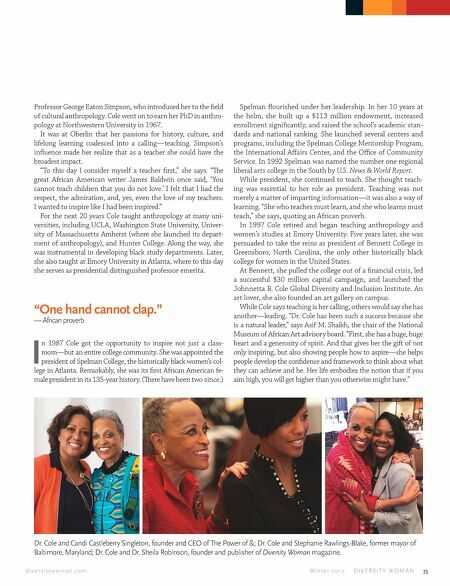 Five years later, she was persuaded to take the reins as president of Bennett College in Greensboro, North Carolina, the only other historically black college for women in the United States. At Bennett, she pulled the college out of a financial crisis, led a successful $30 million capital campaign, and launched the Johnnetta B. Cole Global Diversity and Inclusion Institute. An art lover, she also founded an art gallery on campus. While Cole says teaching is her calling, others would say she has another—leading. "Dr. Cole has been such a success because she is a natural leader," says Asif M. Shaikh, the chair of the National Museum of African Art advisory board. "First, she has a huge, huge heart and a generosity of spirit. And that gives her the gift of not only inspiring, but also showing people how to aspire—she helps people develop the confidence and framework to think about what they can achieve and be. Her life embodies the notion that if you aim high, you will get higher than you otherwise might have." 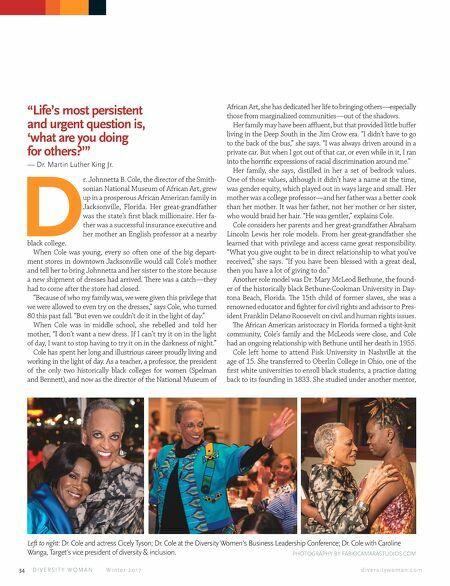 Dr. Cole and Candi Castleberry Singleton, founder and CEO of The Power of &; Dr. Cole and Stephanie Rawlings-Blake, former mayor of Baltimore, Maryland; Dr. Cole and Dr. Sheila Robinson, founder and publisher of Diversity Woman magazine.